Is your banker giving you their best rate? EVEN THE BANK OF CANADA SAYS MORTGAGE BROKERS WILL GET YOU A LOWER RATE. The Bank of Canada did a study a few years ago called Competition in the Canadian Mortgage Market. The study concluded that consumers get a lower interest rate through brokers. They also said that higher income earners were actually paying higher rates because they are less likely to spend the time to shop around for lower rates. Last week, I did an interview for the news media about what a broker does. They also interviewed one of my clients. This client owns more than one property, he’s an experienced real estate investor and a senior manager for a major corporation. He uses my service because I save him time and money. He trusts my advice. It’s that simple. Here’s a link to the article. IS YOUR BANKER GIVING THE BEST RATE? A simple question. How many of us can truly answer, yes? You walk into your branch, you see a posted rate. Then your banker shows you the “special rate” or “discounted rate”. And then maybe they tell you they can do a little better. But how much better? And why aren’t they giving this up front? Don’t loyal customers deserve the best? Does this game sound familiar? This is what the banks have being doing for decades. And it works. Our BIG SIX BANKS are reporting record profits. Great for shareholders but not so great for consumers. Did you get the best? How about the mortgage terms, privileges, penalty calculations? Do you know the differences? Are there better options elsewhere? Is your bank now registering a collateral mortgage? (some banks are..you better know what this means). Are you in a NO FRILLS mortgage? (yes, some banks have these , too. You better know the limitations of these products.). Are you leaving it up to your banker, a bank employee, to tell you if they have the best product for you? By the way, your banker is responsible for maximizing shareholder profits. The higher the rate they can sell you, the more profit the bank makes. 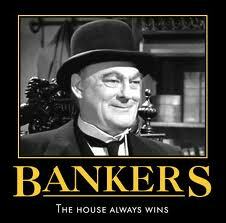 It’s no wonder the BIG SIX BANKS are reporting record profits. In Quarter 1 of 2014, they reported a combined $8.49billion profit. That’s up from $7.64billion in the first quarter of 2013. YOUR BANK IS THE BEST, JUST ASK THEM! I’ve written about paying inflated penalties for years. Choose the wrong Lender and it could cost you $20k, $30k in penalties and more. We’re not talking about some obscure small lender… These penalties amounts are coming from the BIG SIX BANKS (call me, the BANKS have online penalty calculators..I’ll show you the math). Some of us are getting the message and staying clear of Lenders with BIG names but inferior terms. How about choosing the wrong mortgage product? The BANKS have almost always recommended 5 yr fixed rate terms. Sound familiar? Take 5 yr fixed because you’ll know what your payment is for the next 5 years. How did that work out for you? There’s only been a few times in the last 20 years when 5 yr fixed rate made sense. Historically, it’s never been the best product to pay the least amount of interest. Variable rate has been the best choice, most of the time. Yet, not all Variable rate mortgages are alike.. You better know the differences. It’s almost impossible for the average consumer to know all the product offerings all the time. Products change. New products get released often. Special, unadvertised rates and products get released regularly. Choosing incorrectly will cost you money. Save yourself time, money and uncertainty. Contact an experienced mortgage broker. Brokers can give you unbiased, market neutral advice. A Broker specializes in mortgages. They know which Lenders have the best product offerings. They will recommend products from several competing lenders. Mortgage Brokers work for you. And like the Bank of Canada report says, you will usually get a lower rate. Previous Previous post: 2.99% is back… does that mean we should take it? Next Next post: A 2nd mortgage? Yes, this option can save you money. This electronic mail transmission and any accompanying attachments contain confidential information intended only for the use of the individual or entity named above. Any dissemination, distribution, copying or action taken in reliance on the contents of this communication by anyone other than the intended recipient is strictly prohibited. If you have received this communication in error please immediately delete it and notify the sender. CanadaMortgageNews.ca Is your banker giving you their best rate?